The global autonomous vehicle market is experiencing an exponential growth rate due to the rising concerns for improving road safety and ease of driving experience. This high scale of growth of the autonomous vehicle industry is subsequently influencing the market, wherein companies are testing the efficiency and feasibility of their automated systems. Furthermore, usage of automated vehicles is expected to decrease the overall road congestion, therefore, improving the traffic flow to a certain level. The different level of vehicle automation include level 1 (Advanced Driver Assistance Systems), level 2 (partial automation), level 3 (conditional automation), level 4 (high automation) and level 5 (fully autonomous). By analysis, the number of vehicles (both passenger cars and commercial vehicles) equipped with level 2 autonomous systems in 2016, is estimated to be 2.73 million units. It examines the prime supply and demand side factors affecting the growth of the market along with the current and future trends prevalent in the global autonomous vehicle market. A detailed competitive analysis has been included in this report which focuses on the key market developments & strategies followed by the key players in the market. 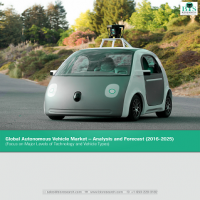 Autonomous vehicle market has been analyzed for all geographies including North America, Europe, Asia-Pacific, and Rest of the World with further analysis with respect to the level of automation. Further, individual regions has been segmented and analyzed according to major countries. The key market players are analyzed and profiled in detail in the report. This section covers business financials, company snapshots, key products & services, major developments, and future programs (if any). Automobiles are one of the most important components of the transportation system, and have emerged as an essential necessity for every individual in the modern times. This factor contributes primarily to the increase in number of vehicles on the road at present, and therefore, leads to an increase in the number of accidents and road congestion. In order to curb the high traffic density and improvise the overall road safety, there is an impending need of autonomous vehicles. Autonomous vehicles do not depend majorly on the driver’s input, but also analyze the surrounding data and plan the further movement trajectory of the automobile. The surrounding data is collected by components such as cameras, radars, and LiDARs among other sensors. The data is then processed by efficient processors and using high level software, the transverse and lateral movement of the vehicle is planned. In order to reduce the burden on drivers allowing them to multitask during the journey and relatively diminishing the need of human drivers for controlling the vehicle, the autonomous vehicle market is expanding at an exponential pace. Depending upon the capabilities and limitations of the systems, the autonomous systems can be divided into different levels of automation. These levels include level 1 (Advanced Driver Assistance Systems), level 2 (partial automation), level 3 (conditional automation), level 4 (high automation) and level 5 (fully autonomous). At present, level 1 and level 2 autonomous systems are commercially available in the vehicles, while higher level of automations are in testing phase. Some of the key players providing autonomous features for vehicles include Daimler AG, Audi AG, General Motors Company, Toyota Motor Corporation, Ford Motor Company, Tesla Motors, Bayerische Motoren Werke AG, Denso Corporation, HERE and Mobileye N.V. The number of vehicles (including both passenger cars and commercial vehicles) with inbuilt level 2 autonomous features was estimated to be 2.73 million units in the year 2016. This number is expected to grow at a double digit CAGR in the upcoming years, owing to increasing demand of level 2 automation features in the vehicles. Higher level of automation (level 3, level 4 and level 5) are presently under testing phase, several manufacturers are testing the effectiveness and feasibility of vehicles equipped with higher level automated system on public roads. The penetration rate of level 3, level 4 and level 5 technology in passenger cars is anticipated to be 0.016%, 0.0023% and 0.0024%, respectively in the year 2020. Furthermore, in order to achieve the goal of fully human-independent vehicles, the penetration rate of these higher level automation features is expected to increase exponentially in the period 2020-2025. Passenger cars hold the major market share for different level of autonomous features, due to high production rate, high registration of passenger cars and lesser complexity in developing autonomous systems as compared to commercial vehicles. Autonomous systems for commercial vehicles are expected to grow at a higher CAGR in comparison to the passenger cars, owing to the wide end-use applications of commercial vehicles such as transportation and cab sharing, among others. In addition to this, stringent laws imposed by government in order to increase road safety, contributes to the high growth rate of the commercial autonomous vehicle market. Europe being home to a number of autonomous vehicle OEMs and major component manufacturers, holds the major share in the market of vehicle equipped with lower level autonomous features. The European players are rapidly expanding their footprints to gain presence in the self-driving market. Lower level of automation has been commercialized in this region and to further achieve high market presence, players are working to develop advance level of automation. At the same time, North America, being one of the most technologically advanced regions, is expected to lead the market for higher level automation. At the same time, autonomous technology in the APAC region is limited to certain countries only. However, due to the presence of industry players and escalating demand of automated systems in this region, a rapid growth of higher level of automation in the future years is anticipated over the forecast period.